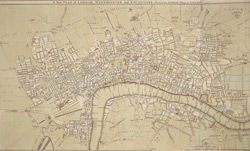 This map highlights in red the boundaries of the old London Wall, built by the Romans. By the end of the 17th century it had become an anachronistic nuisance. The first section (near Bishops Gate) was removed in 1707 and much of the rest was broken down or built over during the 18th century. Most of the gates were pulled down in 1760/1, wtih Newgate, the last to survive, demolished in 1777.